There are a number of excellent OTDR devices available in the market, from small portable units designed for field use, to sophisticated laboratory-grade devices that can provide a wide range of features intended for advanced users. Regardless of the type of OTDR itself, the one complimentary training item that is always required is a length of test fiber. (Note: An OTDR launch fiber may also be required for overcoming the “dead zone” of a fiber-under-test, which is discussed here). More importantly, the length of fiber should include issues or "events" to be identified by the device, simulating real-world factors in the classroom. While most training facilities use unsecured fiber spools on the desktop, this is generally not a best practice, as the delicate fiber is frequently at risk of damage during handling. Since the fiber will be used by many students over time, it is a benefit to both the instructors and the students to utilize a more professional setup designed to protect the fiber and provide consistent results. By utilizing a Fiber Lab solution from M2 Optics, a number of benefits can be realized that are not available when using a traditional, unsecured fiber spool. For convenience, we have outlined a number of key benefits below. 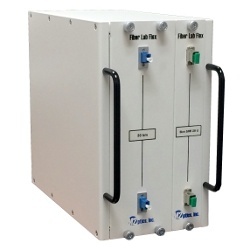 The fiber can include in-line events representing field splices, connectors and patch panels, or other factors that affect performance. A Fiber Lab offers both a training facility and it's students the opportunity to bring the field network right into the classroom for practical, hands-on experience. For the instructors, it is a great value to have a useful tool that can be used for teaching demonstrations and tests, while ensuring that students have learned the OTDR skills necessary to be successful in the field.